Through embodied practices and mindful movement, as well as many other immersive experiences, workshops and techniques. 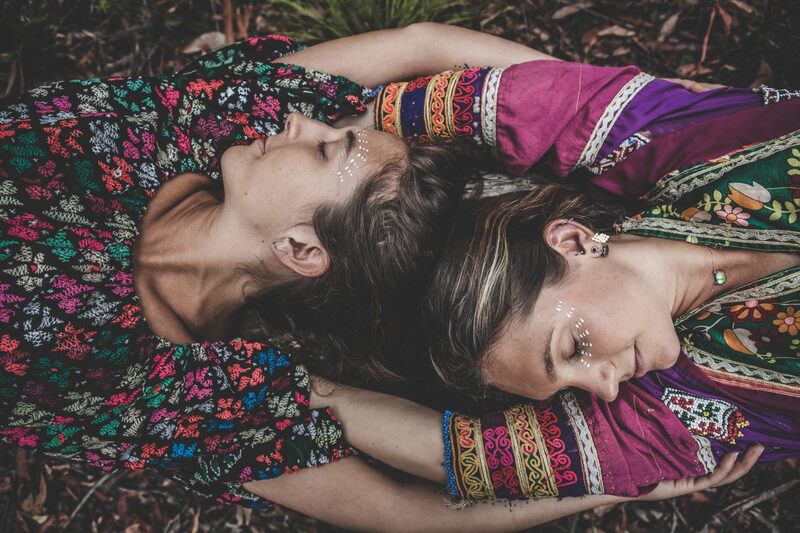 Brooke and Lara and their team hope to ignite a spark within participants that changes their way of being into one that is more open, joyful and more connected to themselves and others. Yoga and meditation: All sessions will be all levels, with a focus on accessing meditative states and healing through breath, body and movement. Sessions offer long, slow and gentle yoga to honor the need for time, space and deep listening to cultivate the most intimate state of connectivity to self and life. The workshops are intentionally poetic, designed to take participants on a deep dive into parts of their being that are yearning to be reached and reflected on. The belief is that the more a sense of ease is felt inside, the more reality shifts around us to reflect the miraculous gifts of living, breathing and being, until even the most ordinary moments can be lived and experienced as extraordinary. Soul Drummer Sydney: Soul Drummer brings traditional, African drums for each participant as well as other fun hand held instruments that lead the group on a rhythm filled journey with lots of fun activities, offering African drumming, songs, rhythm games, storytelling as well as movement and dance. Benny Holloway: Byron Bay based musician with stirring and evocative tones that penetrate like sonic acupuncture into the deepest layers of the body and mind. Through live electronic looping and weaving his voice with guitar, he has become known for his psychedelic and soothing ambient sound baths – encouraging listeners on a compelling introspective journey. Come and lie on his rosewood acoustic sound bed leading to deep states of relaxation, healing, lucid awareness and spiritual awakening. To enquire: Please contact Sargood on Collaroy 02 8597 0600. Please note there are only 6 places available in this course. 5 day Back2Roots retreat including yoga and meditation, Soul Drumming and Benny Holloway. 5 day Back2Roots retreat including yoga and meditation, Soul Drumming and Benny Holloway. Meals catered: 5 breakfasts, 5 lunches and 4 dinners. Breakfast Mon – Fri, Lunch Mon – Fri, Dinner Mon –Thurs. Meals catered: 5 breakfasts, 5 lunches and 4 dinners. Breakfast Mon – Fri, Lunch Mon – Fri, Dinner Mon –Thurs. Royal Rehab is an NDIS accredited provider based in Sydney. NDIS participants may be able to seek assistance to support their stay at Sargood On Collaroy and their participation in this course through the NDIA. For information on funding through the NDIS, click here. icare participants can choose to use their preapproved stay days (up to 28 days) at Sargood on Collaroy to participate in this course. For information on funding through icare, click here.